Believed to be the most powerful member of the Fantastic Four, Susan Richards can make objects invisible, but she can also create invisible force fields using only her mind. 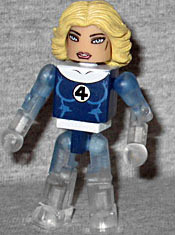 It's surprising that in more than a decade of Marvel Minimates, this is the first time we've gotten the FF's "Negative Zone" costumes - the ones with dark bodies and white accents, which first appeared in Fantastic Four #256. Being an Invisible Woman toy, she naturally comes with a few extra "invisible" bodyparts, in this case arms and legs. They're perfectly clear at the extremities, but blue fades in as you near her torso. She also has two haircuts: the normal one, which she's wearing in the package, and the utterly unfortunate mullet that John Byrne foisted upon her for some unfathomable reason. 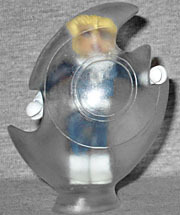 The figure is officially named "Force Field" Invisible Woman, but she doesn't just come with one of the small shields like all the Sues before her. No, this one goes all out. See, this figure represents the era when she went from calling herself the Invisible Girl to the Invisible Woman, and was also marked by a drastic increase in her power levels. So rather than a little shield, she comes with a giant, irregularly shaped half-shell that's big enough to cover her from head to toe. More, in fact: there's a footpeg in there so she can stand slightly off the ground. It's a fun piece, but a bit too opaque to really qualify as "invisible." Aww, cute little Moloids! They're the armybuilder for this series, which makes sense since there was always a horde of them crawling all over everything. 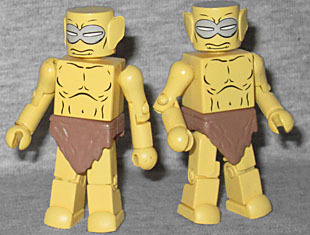 They're bright yellow, and wearing the same loincloth as Weapon X Wolverine. He has the short "slipper" feet, but could have really used the "child" limbs to make him even shorter than he already is. He's already using Panthro's head, so the Thundercats parts were clearly up for grabs. Blinded in the accident that took her father's life, Alicia is a talented sculptor, a skill she shares with her step-father the Puppet Master. She loves the Thing for his inner nobility. It's kind of appropriate that Alicia is the variant of Sue, since at least twice in the comics it's been a plot point that they looked nearly identical. 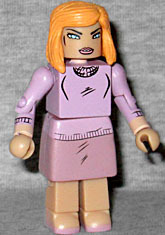 She's wearing a pink sweater and a purple skirt, and her hair is slightly more orange than Sue's. Her irises are pale blue, and instead of a black pupil, she's just got a dot of white to convey her blindness. As the bio mentioned, Alicia is a talented sculptor, and the Thing is one of her favorite subjects (it's been suggested that being around her father's radioactive clay gave her a low level version of Daredevil's radar sense, which is why she can sculpt such accurate likenesses). To show her talent, the figure comes with a 2" tall accessory, depicting a bust of Thing on a pedestal. The torso has sculpted stones, but in true Minimate style, the head is smooth. It's the same size as a standard Minimate head: you can tell, because it's got a stony cap like Things have been coming with since Series 5 - and yet it's a new sculpt. The heck?